By Jeff Aranow: Sergiy Derevyanchenko (13-1, 10 KOs) says he’s ready to fight ALL the champions at 160 following his tough 12 round unanimous decision win over Jack Culcay (25-4, 13 KOs) in an IBF middleweight title eliminator last Saturday night on the undercard of the Caleb Truax vs. Peter Quillin fight at the Minneapolis Armory, in Minneapolis, Minnesota. Derevyanchenko put himself back in line for a title shot against the winner of the Saul Canelo Alvarez vs. Daniel Jacobs fight on May 4. It’s a big deal for Derevyanchenko, because he’s got the chance to make some life changing money against Canelo or Jacobs, especially if he can beat the winner of that fight or Gennady Golovkin, who will likely fight Canelo in September. It wasn’t an easy win for the 33-year-old Derevyanchenko, because Culcay fought tooth and nail in the last part of the fight, trying to rally to pull out the victory. Culcay’s mistake of trying to using his boxing skills early in the fight was ultimately his undoing, due to the fact that Derevyanchenko was taking the fight to him and throwing the better shots. The judges weren’t going to ignore those big shots from the 33-year-old Derevyanchenko, and give the rounds to the pure boxer Culcay. That was a mistake that Culcay and his team made in thinking they could win rounds by boxing Derevyanchenko in the first six rounds of the fight rather than slugging it out. The scores were 115-113, 116-112, and 116-112, all for Derevyanchenko. “I want the big fights,” said Derevyanchenko. “I’m ready for any of the champions. I’m not backing down from anyone. I knew that he was going to move a lot,” said Derevyanchenko. “We prepared for it because we knew what kind of fighter he was. My mentality was that I had to seek and destroy,” Derevyanchenko said. Culcay boxed well, but he didn’t throw enough power shots to take command of the fight in the first six rounds. Culcay was putting his shots together, but then he wouldn’t stay in the pocket long enough to show the judges and the boxing fans that he wanted the fight. He kept moving around the ring, trying to keep Derevyanchenko off of him. It looked like Culcay was afraid of the power of Derevyanchenko, and that wasn’t missed by the judges. Culcay’s corner should have pulled him aside early in the fight and told him that he was blowing his chances of winning by being too elusive. 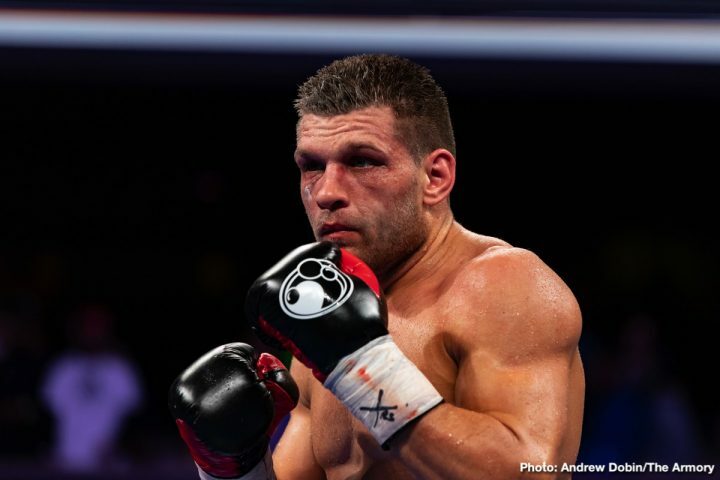 Perhaps if the fight had taken place in Germany, where Culcay now lives, he would have done better by boxing Derevyanchenko, but didn’t play out well with the judges last Saturday night in Minneapolis. Although Culcay did well enough in the first three rounds to potentially have a small lead, Derevyanchenko upped the pressure he was putting on him starting in the fourth round. He started putting his punches together, and he did a better job of cutting off the ring on Culcay to force him to exchange. Derevyanchenko’s shots looked slow, but powerful. He was landing some thudding shots, and Culcay couldn’t answer back with the same kind of power. Culcay was still using a lot of movement, but Derevyanchenko did a better job of trapping him, and landing big punches before he would squirm away and continue moving. It looked like Culcay didn’t want any part of standing in the trenches with Derevyanchenko starting from the 4th round. Culcay did a good job of making adjustments in the final three rounds by staying close to Derevyanchenko, and not letting him get the leverage on his shots that he wanted to. In the 10th, Culcay hurt Derevyanchenko with a big shot that saw him almost go down. Derevyanchenko came back and fought well in the 12th round, nailing Culcay with some right hands and left hooks from medium distance. Culcay was loading up with everything he threw trying to score a knockdown or knockout, but it wasn’t to be. Derevyanchenko was the far busier fighter of the two, and this impressed the judges. Derevyanchenko landed 2229 of 887 shots with a connect percentage of 25.8%. For his part, Culcay landed 145 of 476 punches for a higher connect percentage of 30.5%. As lopsided as the punch stats were, it’s surprising that the scoring for the fight wasn’t more in Derevyanchenko’s favor than they were. The judges obviously liked Culcay’s boxing skills enough for them to score closely at 115-113, 116-112 and 116-112. After the fight, Culcay complained, saying that he thought he’d done enough to get the ‘W’ with the way he had fought. Culcay might not have realized that the judges and the boxing fans at ringside were more impressed with all the punches that Derevyanchenko was throwing. When you’re opponent throws and lands almost twice amount of punches, you’re going to lose nine out of ten unless you score a knockdown. Culcay hurt Derevyanchenko in round 10, but he wasn’t able to capitalize on it. Derevyanchenko regained his bearings, and came back hard to outwork Culcay in the last couple of rounds to seal the victory. By now, Culcay has seen the fight on replay, and recognizes that he failed to do enough to have his hand raised. It’s a good learning fight for Culcay. Next time he gets an opportunity to fight in a title eliminator, he’ll realize that he needs to be more aggressive, throw many more punches, and use less movement. Derevyanchenko will probably need to wait until 2020 before he can get a title shot for the IBF belt. That might be against Canelo, Jacobs or Gennady Golovkin. There’s also a possibility that whoever emerges as the IBF champion after a series of fights involving Canelo, Jacobs and GGG, they might choose to vacate the IBF belt rather than fight Derevyanchenko next year.